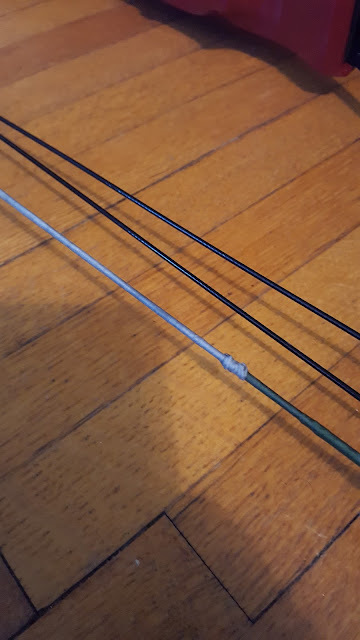 I have discovered I have some skill at fixing older model compound bows. 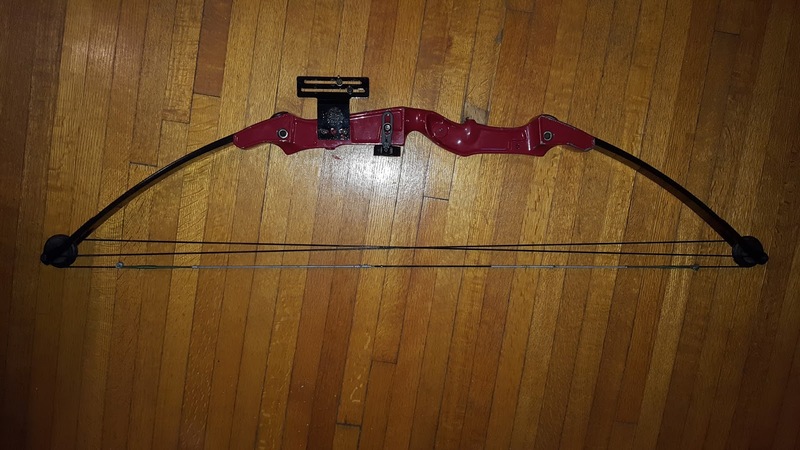 Three weeks ago a friend at the Toronto Archery Range approached me with a cherry red older model compound bow (I estimate it was made in the mid 1980s) that was literally in shambles. The bowstring, cams, cables, and various other parts were in a ziplock bag and the compound bow itself was basically just the riser and limbs. He wanted to know if there was any chance of fixing it. BACKGROUND - I have fixed other compound bows before, usually while at the archery range and doing what I call "Compound Bow Triage". I set up my tools on an "operating table" (picnic table) and perform "emergency surgery" to repair the bow. I have done it for people so many times I have lost track. Apparently I have developed a reputation for being able to fix compound bows, both newer models and older models. So when my friend brought me the wreck of a bow at the time I didn't know if it was possible. It was in shambles after all, and I had never tried to fix a compound bow that was in such a state of "pieces". But as someone who was raised on Lego who loves building and repairing things, I told him "I make no guarantees, but I am willing to give it a shot." I honestly wasn't expecting much. It was in such a bad shape I was expecting it to be missing too many parts that it might be impossible to fully repair. We even joked about taking off the limbs and turning it into a 'Frankenstein' recurve bow, that is how little faith I had in it being possible to repair it. It is fixed. Just finished repairing it this morning. Above and Below: "The Red Brute"
Fortunately most of the parts were there. I call it "The Red Brute", and I shall explain why. This compound bow vibrates like crazy when you shoot it. The vibrations jar me all the way up to the shoulder. Think of shooting this bow like riding a wild bronco. It is going to shake a lot and try to buck you off. It is also very noisy, partially because the bow is missing a string stop (see further below). Or alternatively if you like car metaphors, it shakes like an old jalopy. A jalopy is a really old decrepit car that is in horrible condition, could break at any moment, and literally shakes when you drive it. Some people enjoy driving a jalopy, but they are not for everyone. But the Red Brute is powerful, and it is certainly accurate at close distances judging by the clusters I did this morning. Next Sunday I will take it to the range and test it out at longer distances, and return it to its owner. So what needed to be repaired??? The first order of business was getting the cams, cables and bowstring back on the bow itself. They were a jumbled mess so I had to unjumble them and then figure out what goes where via a little trial and error / logic. The cam axles were missing two external C-shaped 3/16th inch snap rings that keep the axle from sliding around and falling off. That required a trip to the Sunnybrook Home Hardware and $1.57 for the tiny parts. My friend didn't bother putting an arrow rest on the bow, as he reportedly bought the bow along with several other bows at a proverbial garage sale. Bought the whole box of them. 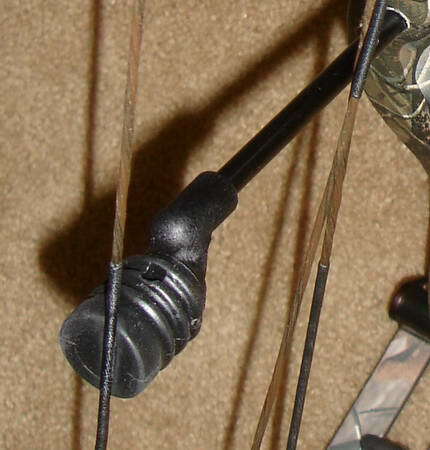 So I added an old Hostage arrow rest from my box of old archery equipment stuff that I don't use any more. I needed the arrow rest on there so I could take the bow out to the garage and shoot it multiple times to make sure it was actually safe to use. I shot it 50+ times, during which I discovered how loud, noisy, and jarring it was. Overall I enjoyed fixing this old compound bow. It was a complete wreck, in shambles, and it now can shoot quite accurately despite the shaking and shoulder jarring. I had a good deal of satisfaction shooting it in my garage. However due to the vibrations I would probably want to do several things to get more accuracy and reduce the jarring. The most important of these is #3. #1. 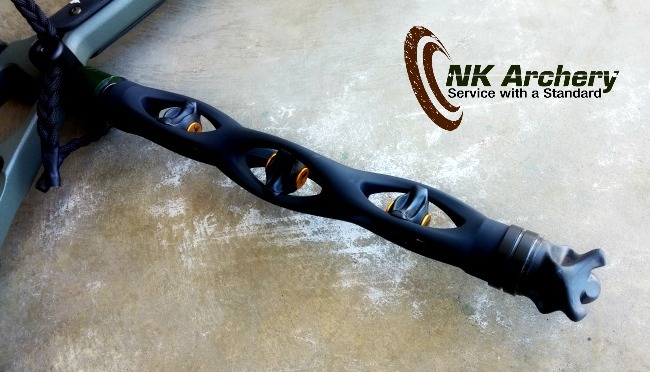 Add a Trophy Ridge 9 Inch Static Stabilizer to reduce vibrations / increase accuracy. I have tried other stabilizers, but this is my favourite thus far. #2.Add Limbsavers to reduce vibrations and noise. #3. Add a String Stop to reduce noise and vibration. The Red Brute has a slot for a string stop, but that part is missing, hence the noise/vibration. 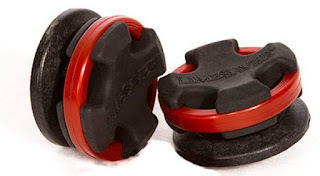 I browsed Amazon.com to check out the prices of string stops, but sadly they are a bit pricey. $50 to $200 each, depending on the model type. 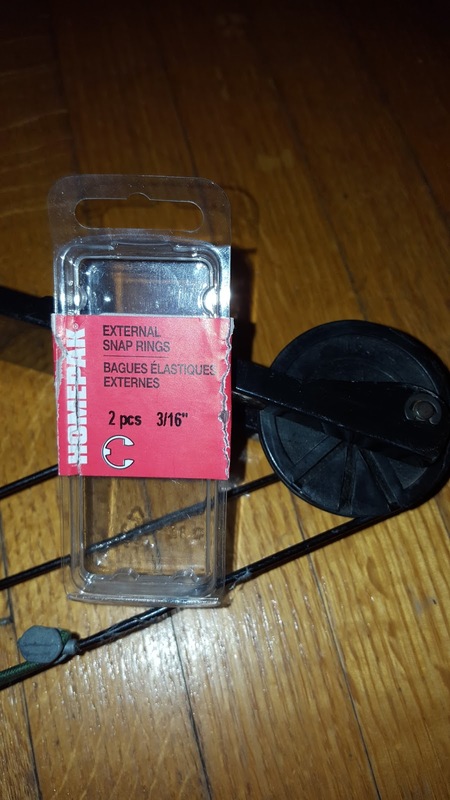 The final results is that this is a compound bow that has speed, power and accuracy, but desperately needs a string stop and perhaps a few extra gadgets to help make it quieter / vibrate less. It is approx. 60 lbs with a 29" draw length, with 50% let off. $30 for repairs / labour. $10 for string serving (material + labour). Overall, I am very pleased that I was able to fix this bow. I regret not taking a photo of what it looked like before I started repairing it. People would have been able to see the before and the after. 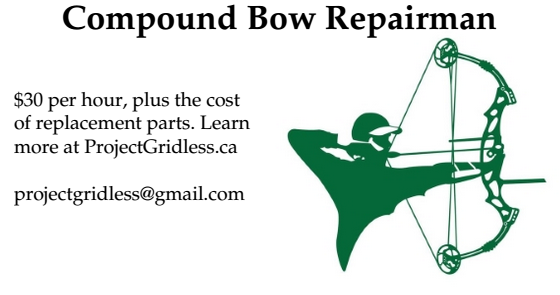 So if other people out there in Toronto are looking to have their old compound bow repaired, let me know and I will give it a try. I really enjoyed fixing this one and I am willing to try fixing other bows too. So if you have an old bow and it is in bad shape / in need of repairs, let me know and I will try to fix it. If all or most of the parts are there we can see what can be done. If many of the parts are missing, but you like the idea of a 'Frankenstein Bow' I am still willing to do that as well. I charge $30 per hour plus the cost of any replacement parts. "I make no guarantees, but I am willing to give it a shot." I'm the friend who brought the bow to Charles. This is no less than a resurrection. 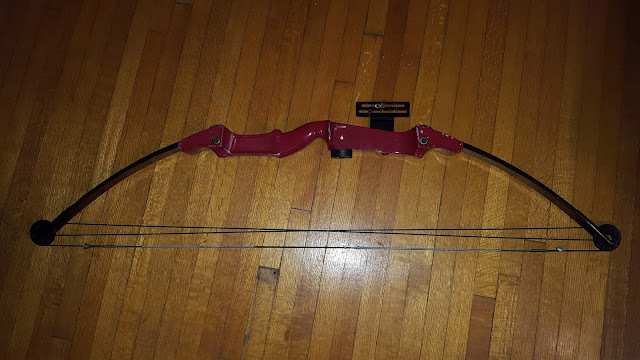 The backstory starts when I found a seller in Niagara-on-the-Lake with 3 compound bows for sale for $150. A quick trip out there early one Sunday morning (at the right time of year to score multiple jars of honey and jams along the way) put me together with a gentleman who stopped hunting and just wanted to get some cash for his old equipment. I paid him happily and brought the bows back to the city. Another friend gave me $75 for one of them - a nice, old black compound that he is using currently and getting nice groupings at 50 yards. I kept (and use) an older one with wood limbs and camouflage paint. It's quality certainly exceeds my skill but I clearly just don't get to the range often enough. The red one languished for a couple of years before Charles was kind enough to take it on. He was clear it was on a best efforts basis and my expectations were not high but the results are incredible. Charles has it set to 60lbs. draw so this might become my hunting bow. The silencing and dampening parts are available on Amazon for ~~$100+tax (shipping extra). I would put the link to my Amazon Archery list here but (understandably) the comment won't get approved by the moderators. I can definitely refer Charles both for his skills and workmanship and as a person who deals squarely. Get it out of storage. Get it fixed. Get out on the range.